In recent years, Hollywood has been dominated by films with colossal amounts of special effects, outrageous action scenes, and sequels to entertain viewers. Quality acting (the very factor that enables actors to win the prestigious awards) has seemingly become secondary to the aforementioned features for movies. Refreshingly, the French drama, The Artist, in outstanding fashion, illustrates that audiences can still be wooed by a relic of the past: a silent movie. George Valentin (Jean Dujardin) and Peppy Miller (Bérénice Bejo) dancing together for a film. The two actors have great chemistry on set. The fresh faces include an upcoming young, pretty woman called Peppy Miller (Bérénice Bejo – A Knight’s Tale, Prey, The Scapegoat), who had been randomly photographed with George. Rapidly, she is replacing him. Between her and the Wall Street Crash of October 1929, George’s world is rapidly falling apart. He has to adapt to the times, something he’s loathe to do, or he faces the axe. The Artist’s plot is straightforward and surprisingly easy to follow. Despite the lack of dialogue, one always understands the situation. The performances from the cast throughout the movie are brilliant. Jean Dujardin plays magnificently as the proud and stubborn actor, who is unwilling to be pragmatic. Bérénice Bejo is superb as the ambitious young actress. John Goodman plays well as the ruthless boss, who realises that public opinion has changed. Penelope Ann Miller (Kindergarten Cop, Blonde Ambition, Saving Lincoln) performs commendably as George’s trophy wife, who has no desire to be with a man whose best years are seemingly behind him. James Cromwell (The Green Mile, 24: Day 6, Still) does a fine job of being George’s loyal valet. And George’s dog, which is linked to him seemingly telepathically, adds a cute, sentimental aspect to the storyline. 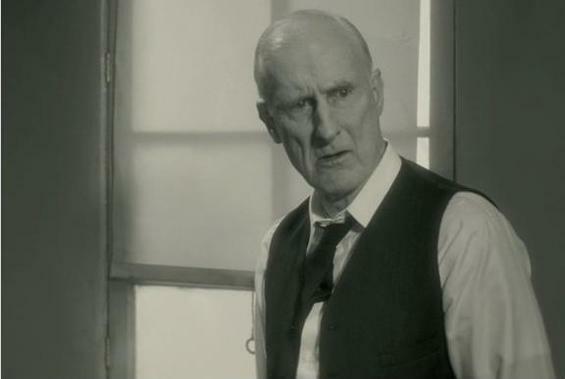 Clifton (James Cromwell), looking concerned for his master, George. But the brilliance of the acting is very different from other exceptional performances, such as Colin Firth’s in The King’s Speech or Christian Bale’s in The Fighter. Remarkably, using body language and emotion, the actors stunningly demonstrate that words are not necessarily needed to portray human relationships and circumstances. Director Michel Hazanavicius (OSS 117: Cairo, Nest of Spies, OSS 117: Lost In Rio, The Players) does occasionally use bubbles of words to explain the context, which help, but they’re infrequent and hardly worth a mention. If anything, it is not the words on the screen that aids the audience, but the music. The score greatly aids viewers to empathise with the characters. The 1920s-style music may not be like the enchanting scores of The Lord of the Rings or Inception, but it always captures the mood of the characters in The Artist. Whenever their temperament changes, so does the music to enhance the scene. 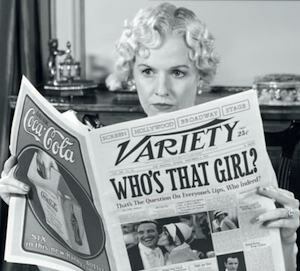 Doris (Penelope Ann Miller), George’s wife, disgusted with her husband for being photographed in the papers with a younger, more beautiful woman than herself. Similarly, the movie has no breathtaking landscapes to charm viewers, like in The Way Back or True Grit. 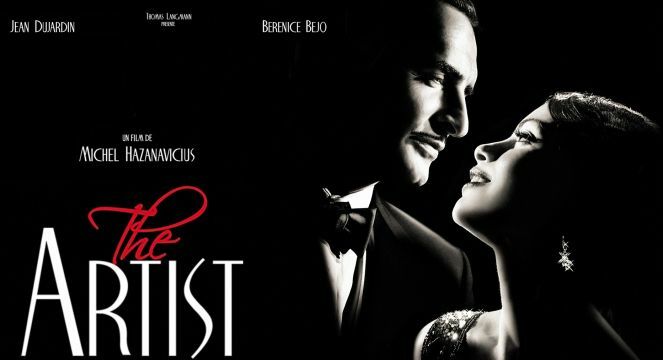 The Artist though captures its era magnificently, from the clothes the characters wear; to their hairstyles (Bérénice Bejo looks strikingly similar to Marion Cotillard in Midnight In Paris); to their cars; to their cameras; to the interior designs of their houses (which have some resemblance to the First-Class rooms and halls in the sunken Titanic). One could perhaps criticise the film for not depicting the Great Depression of the 1930s adequately. Yet, this was not the purpose of the film either, so one should not blame the director on this matter. On the whole, The Artist is a work of art. It brings us back to pure cinema and makes viewers realise that when a film has acting of such phenomenal quality, then dialogue, special effects and action are not absolutely necessary to make an entertaining and dazzling film. This entry was posted in Drama, Silent and tagged bafta winning, Bérénice Bejo, film, james cromwell, jean Dujardin, john goodman, Michel Hazanavicius, movie, oscar nomination, red state, review, silent, silent film, the artist. Bookmark the permalink. Wonderful review, which faithfully encapsulates all the great qualities of the film!